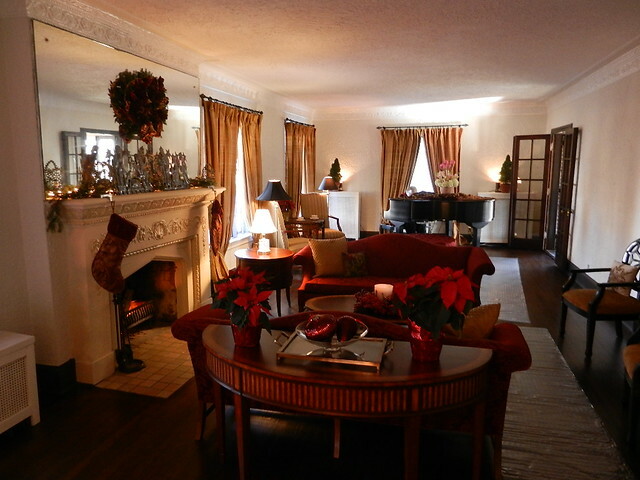 Detroit is home to several historic neighborhoods; through the years some of these neighborhoods have put together annual home tours, one of my favorites is the Boston-Edison Holiday Home Tour. The Boston Edison Historic District is made up of over 900 single family homes encompassing four streets: W. Boston Blvd, Chicago Blvd, Longfellow and Edison between Woodward and Linwood. Most of the homes were built between 1905-1925, popular architectural styles of the time include: English Tudor Revival, Greek Revival, French Provincial, Italian Renaissance and Prairie style. The location of the neighborhood and close proximity to Henry Ford Hospital made it a desirable place to live, many of the wealthy movers and shakers of Detroit took residence here: Henry Ford, SS Kresge, B Siegel, Horace Rackam, Ira Grinell, James Couzens, Ty Cobb, 4 of the 7 Fisher brothers, Joe Louis, Berry Gordy, and Walter Briggs, to name a few…….They say that Mr. Sanders and Mr. Vernors, who both lived on Boston Blvd, one day combined Sanders Vanilla Ice Cream and Vernors ginger ale, they liked it so much they decided to name the concoction after their shared street, thus creating The Boston Cooler. 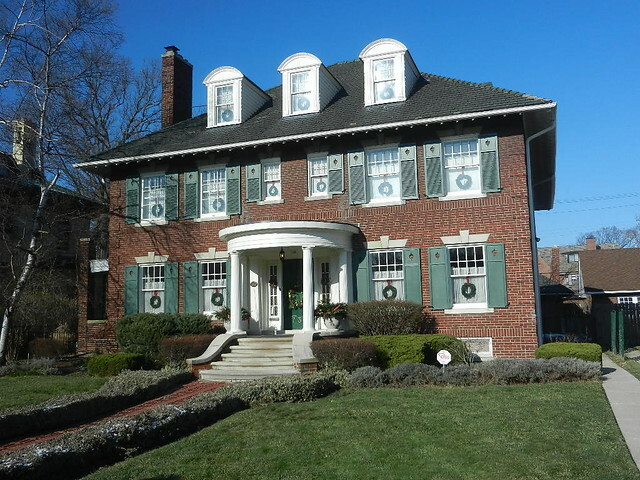 The home tour is a fundraiser for the Boston Edison association, proceeds go to their general fund, with a portion put aside for beautification projects in the neighborhood. 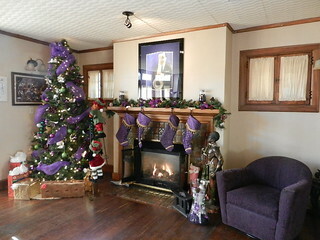 This is a well organized tour; tickets are only sold in advance, you choose your tour time when you order your tickets. 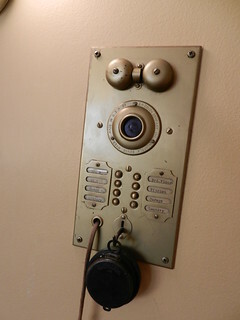 The tour begins at Sacred Heart Seminary; here you check in and trade your ticket for a tour book, at your designated tour time you climb aboard an awaiting school bus that takes you to all five homes. Tours are limited to 30 people, you have your own personal tour guide who actually lives in the neighborhood, they can tell some great stories! As the bus travels through neighborhood streets your guide will point out significant houses; The Charles T Fisher house at 18,000 sq ft is the largest house in Boston-Edison, the SS Kresge home built in 1914 in the Mediterranean Villa style is the largest lot in the neighborhood, on your left is the former home of JL Hudson, you get the idea…..the list of families who lived here is quite impressive. We had brought along a friend who is working on getting her architecture license, we were sure she would enjoy the homes as much as we would. Our first stop was on Longfellow Ave, a charming 3-story home built in 1920. Purchased only 4 months ago, the current owners have done a lovely job making it their own. 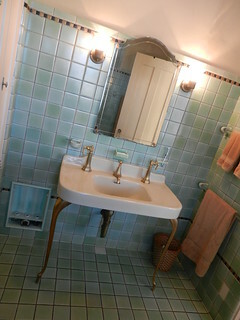 The Pewabic tile fireplace surround is superb. Over to Boston Blvd next, first occupied in 1920, the current owners have lived here for two years, this house still has its original built in Frigidaire, and a stunning Pierpont mirror in the upstairs hall.The decorative plaster in the living room is splendid and gives the room a formal feel. 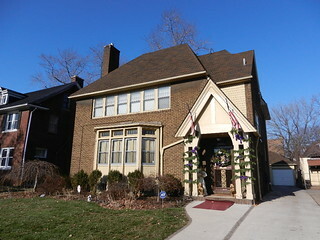 Chicago Blvd was next, this home was built in 1919 in the Georgian Revival style, current owners have lived here since 1994. Through the years they have done an amazing job keeping the original features of the home while personalizing it, they have wonderful whimsical collections all through the house. This home retains its original tile roof and window shutters. Just across the street was house #4, a gorgeous English Tudor built in 1928. I have a soft spot for the Tudor style, and this one took my breath away. Heavily textured plaster work throughout the home, the fireplace mantel and surround in the living room features an intricate design that matches the molding around the ceiling, the dining room boasts 2 sets of french doors and a raised plaster design that forms a ring on the ceiling. The current homeowners bought the house five years ago. 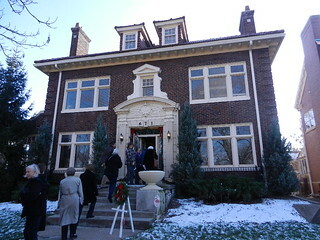 The last home on the tour was on Edison Ave, built in 1914 the current owner has lived here since 2003. While the exterior is an example of American Eclectic style, the interior has definite Arts and Crafts influences, another style I love. 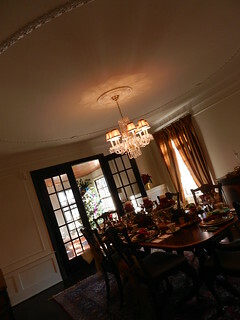 I’d have to say the dining room was my favorite room in the house, the Arts and Crafts style prevailed here, from the stained glass light over the dining room table, to the furniture itself and the leaded glass windows. 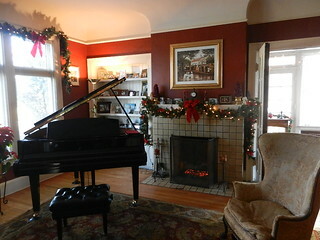 The french doors leading to the living room carry over the same leaded glass pattern as the windows and are enchanting. I was glad to see our friend was as enthused as we were in each home. 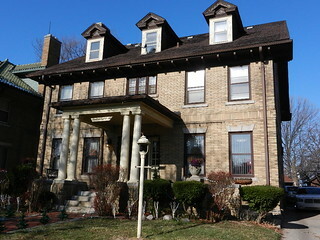 Many people are unaware of the the array of historic homes and neighborhoods in Detroit. After visiting the last home on the tour, our bus took us back to Sacred Heart Seminary; here we could have cookies in the Cardinal Mooney room, and check out old photos of the historic district and it residents. 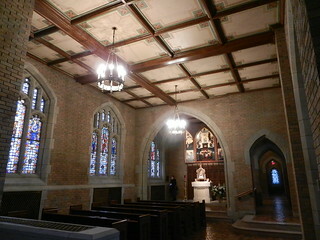 When finished, we walked down the hall to the seminary chapel. 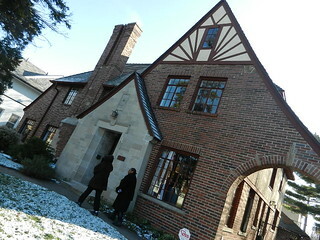 Bishop Gallagher had the seminary built in 1924 in the English Tudor and Gothic architectural style. The chapel itself is Gothic and features stunning stained glass windows imported from Munich Germany. The Fisher brothers were chief donors in the building of the sanctuary, I would say no expense was spared. The sanctuary furniture, choir stalls and credence table are all carved from solid oak, the craftsmanship is incredible. 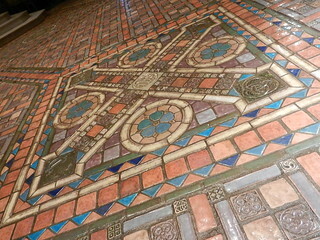 The floor from the front pew forward to the wall is Pewabic Tile, I have never seen it so shiny! The sanctuary window above the alter is a true piece of religious art, I can’t imagine how astonishing it would look with the bright sun shining through it. It’s the kind of place you walk in and the pure sight of it makes you draw in a breath, after staring for a little bit you begin to breathe normally again. I have been in here maybe a dozen times and I still do that. I like to take a seat near the entrance and watch the look on people’s faces as they enter the chapel, everybody seems to have the same reaction, like they can’t believe what they are seeing. 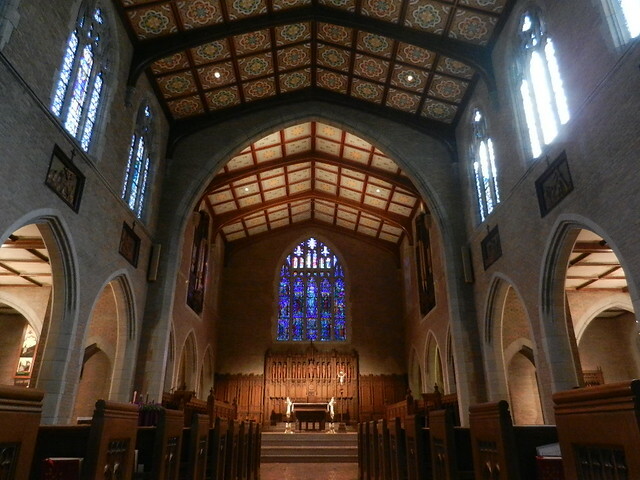 Every inch of the chapel is beautiful, from the ceiling panels and chandeliers to the alter piece and floor. The cookies seemed to rev up our appetite, we wanted to take our friend somewhere she had never been for lunch before, so we chose Traffic Jam & Snug on Canfield and Second. 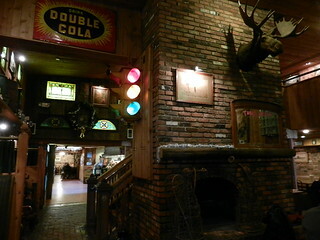 The menu is huge and vegetarian friendly so everybody can find something they like here. Inside there seemed to be a buzz, it was more crowded than the typical Sunday afternoon, then I remembered: Traffic Jam was recently featured on Guy Fieri’s Diners, Drive-Ins and Dives. 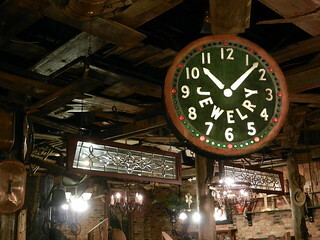 This place is wonderful; the large interior is decorated in an eclectic style, vintage items hang on the walls and sit on shelves. They have their own in-house bakery, micro-brewery, and dairy….they make their own beer, cheese and ice cream! Traffic Jam was actually the very first Brew Pub in the state of Michigan. We were seated in a roomy booth and given the task of deciding what to eat, they have their regular menu and a specials menu, they don’t make it easy do they? Between the three of us we ordered the Traverse City Salad, the Tex-Mex Lentil Burger, and the Pork Loin Kamatsu Salad. The Kamatsu Salad was featured on D,D & Dives; it’s a panko encrusted pork loin pan fried, topped with salad greens, arugula, berries and red onion. It is dressed with a fresh herb vinaigrette and garnished with hot sauce jelly beans, it is excellent! The pork loin is fork tender and the combination of flavors really works. The burger was large and very tasty, as was the TC Salad. Kris enjoyed a cocktail and we girls reveled in the house brewed Java Porter. It has that nice deep porter color and flavors of coffee and chocolate, so good! Our favorite Traffic Jam dessert is the Carlotta Chocolatta; a slice of rich chocolate cheesecake topped with the best coffee ice cream I’ve had, all doused in house made dark chocolate hot fudge. Though our mouths said “get it”, sadly none of us had any room to spare in our stomachs. There’s always next time! ← Rochester’s Big Bright Light Show! Finally got a chance to read this post – love it, and the Boston Cooler trivia is super interesting!! Thanks again so much for that wonderful day of architectural and culinary marvel 🙂 Happy New Year! !